Becoming a veterinary assistant can be an excellent choice for anyone seeking an animal centered career that is accessible to anyone who has turned 18 and has a high school diploma or the equivalent. As a valued member of the veterinary care team, a vet assistant enjoys an excellent salary, in addition to the respect of his or her coworkers, supervisors and clients. A veterinary assistant is an individual who provides general support services to a veterinary clinic, zoo, research lab or other institution that involves working with animals. Vet assistants ensure that the veterinary clinic or other facility is clean and receives the general support it needs to effectively function. Ensure that the veterinary facility is both clean and sanitary. This includes cleaning work areas and those areas frequented by the clinic’s clients. Clean indoor and outdoor animal enclosures in order to ensure that they are maintained in a sterile condition. This can be very important to avoid the spread of communicable diseases among animals currently under the clinic’s care. Clean and properly store all veterinary equipment. This is extremely important to avoid dangerous postoperative infections among the animals. The vet assistant is usually in charge of feeding and watering all the animals. In many cases, the veterinarian will give specific instructions that the vet assistant must follow when it comes providing the proper diet for animals under treatment. Vet assistants regularly walk and otherwise exercise animals that are currently under the care of the veterinary establishment. The vet assistant will regularly take biological samples and provide them to the veterinarian or vet tech for later testing. Some tests, such as X-rays, may be performed by the vet assistant under the supervision of a veterinarian. The vet assistant may administer those medications that have been prescribed by the veterinarian. Directly treat animals without being under the supervision of a qualified veterinarian. Provide a diagnosis of an animal’s condition. Veterinary assistants do not require licensure and are thus not mandated to receive a formal education by the state. However, many veterinary clinics and labs prefer to hire individuals who have received some degree of formal education in this field. Formal training allows the employer to avoid being forced to train a newly hired vet assistant on the job. For vet assistants, completing a vet assistant program also allows them to have official recognition of their training, which can improve a vet assistant’s starting salary. Because of this, many vet assistants seek a formal education, which is usually offered by a community college, vocational training center or adult education service. Vet assistant programs are often offered by schools that are accredited by the American Veterinary Medical Association (AVMA) to offer programs for veterinary technicians. While this accreditation process does not directly involve a vet assistant program, a school that has received accreditation by the AVMA generally provides a highly professional education program for veterinary assistants. 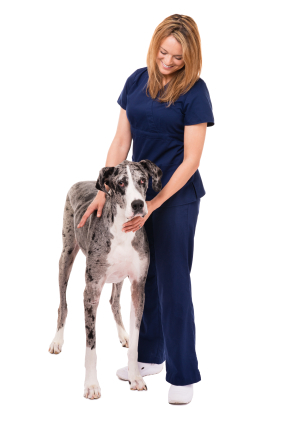 Most vet assistant programs focus on training the student in how to perform the usual duties of a vet assistant. In general, a full-time student can complete a vet assistant program in no more than a single year. Upon completing the program, the student is granted a certificate or completion. Because there is no national authority that regulates vet assistant programs, each certificate is generally unique to the offering institution. In addition to traditional full-time programs, many vet assistant programs offer part-time and online options for those students who cannot attend regular classes. Part-time students usually require more time to complete the program, but are free to organize their class schedule around their home and work responsibilities. Online and distance learning classes involve making use of the Internet to provide education directly to the student. These programs allow the student to interact with his or her instructors and fellow classmates without having to physically attend the school. This can be extremely beneficial for students who have limited mobility, are currently working or who are caring for young or disabled family members. Individuals who have completed a vet assistant program can enter a career that is currently enjoying robust growth. According to the Bureau of Labor Statistics (BLS), there are currently over 71,000 vet assistants working in the United States, and between 2010 and 2020, the number of job openings for vet assistants is likely to grow by at least 14 percent. Attrition among currently employed vet assistants, coupled with the natural growth in the number of job openings, will ensure that new vet assistants will continue to enjoy excellent employment prospects. In terms of salary levels, vet assistants are competitive with other professions requiring a similar level of education and commitment. Nationally, the BLS has determined that the median wage for vet assistants is nearly $25,000. The top 10 percent of vet assistants earn over $35,000. In Arizona, the median wage is $23,560 as of May 2012; however, Arizona’s generally lower cost of living makes this wage competitive with most other state wage levels. This is especially true when considering the higher cost of living found in states such as New York and California, where the vet assistant’s higher wages are generally spent on the necessities of life. Ultimately, becoming a vet assistant can be an excellent choice for someone wishing to become involved in the animal care sector. Due to the lower educational costs associated with vet assistant programs, this can be an ideal choice for individuals with limited financial resources. Furthermore as an entry level profession, a vet assistant can be an ideal choice for an individual who intends to eventually become a vet tech, veterinarian or other higher level veterinary career. By starting as a vet assistant, an individual can obtain practical experience while also obtaining the information he or she needs to determine what type of later veterinary career to seek.